Will ‘Decent Work’ or Victorian brutality mark India’s dash for the top? Although all too often glossed over, Victorian Britain’s harsh working conditions are no secret: ‘Children of nine or ten years…dragged from their squalid beds at two, three, or four o’clock in the morning and compelled to work for a subsistence until ten, eleven or twelve at night, their limbs wearing away, their frames dwindling, their faces whitening’. While working conditions in contemporary India cannot be compared to the depredations of competitive capitalism in nineteenth century England, the fact that India is home to around one quarter of the world’s poor underlines the extent to which its workers are denied the means to meet their basic needs. India’s poor are mostly ‘informal’ workers – those who work in precarious jobs largely beyond the purview of state regulation, with little access to social security, and low levels of collective representation. An estimated 70 per cent of Indian households primarily make a living through informal labour. Prominent among them are the fifty million who work in the construction sector – double the number of a decade ago, making it the country’s largest employer after agriculture. Most are temporary or seasonal migrants escaping severe underemployment in the Indian countryside. Research in a number of Indian states has shown that migrant construction workers in India often face dangerous working conditions and harsh living conditions. 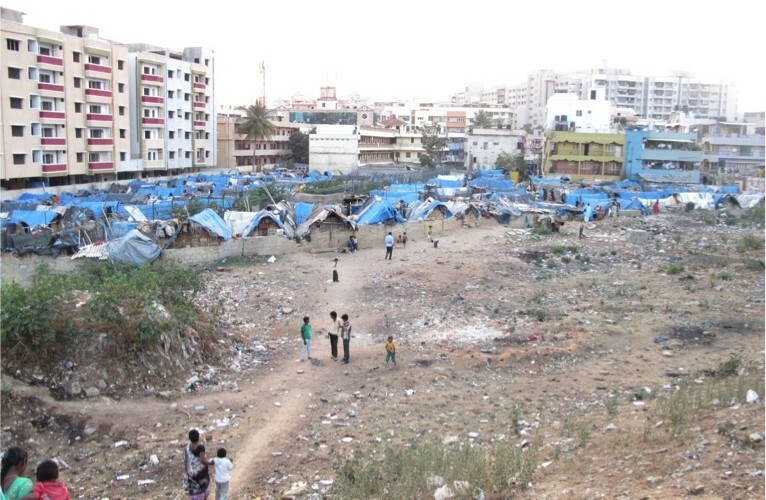 Many live in blue plastic tents without access to basic amenities. Many are recruited by intermediaries who distance workers from principal employers, and may quieten them with ‘advances’ that facilitate the underpayment of already low wages, and may constrain labourers’ movement. Widely subjected to violence on and off site, women’s working days are lengthened by their shouldering of the bulk of reproductive labour. It is far from unusual for female construction workers, who remain confined to lower-waged ‘unskilled’ tasks, to be paid fifty per cent less than their male counterparts for similar work. A number of laws theoretically provide construction workers with minimum conditions and some access to social security, but employers are shielded from their legal responsibilities by complex subcontracting chains. Although most migrants’ incomes rise, many see those gains wiped out by health costs and an almost complete lack of access to social security. Health-related provisions supposedly available to informal workers do not cover outpatient services, leaving most with little choice but to pay unregistered doctors for treatment. Access to the provisions of the Building and other Construction Workers Welfare Boards, meanwhile, remains minimal: in the state of Karnataka less than half of one per cent of the funds collected by the Labour Department had been spent on workers’ welfare by the start of 2016. Migrant workers’ access to government subsidised food grains, moreover, is compromised by impediments to the Public Distribution System’s portability, while the provision of crèches is minimal both among migrant workers and those settled in non-notified slums. The absence of the state is intentional. India’s increasing prominence in the global economy depends on its relatively cheap labour. The state and the construction sector share an interest in providing low-cost infrastructure, and a growing number of politicians have been implicated in real estate scams. On the ground, meanwhile, understaffing in state-level Labour Departments leads to construction companies being asked to ‘self-regulate’. Migrant construction labourers face a perfect storm of adverse conditions – detached from home networks on temporary worksites with minimal protection by state or union; often segmented by caste as well gender, language, and task; largely employed by sub-contractors pressed to reduce labour costs; and with a ready supply of underemployed workers waiting in the wings. Unlike garment sector workers who supply reputation-sensitive high street brands on an ongoing basis, construction labourers work for low-key employers on a ‘timebound’ basis and are relatively invisible – long gone by the time high-profile tenants move into their offices; their blue plastic huts, more often than not, replaced by manicured lawns that provide an altogether more pleasant backdrop to white collar working lives. While India’s growth rates continue to outpace those of other major economies, and its international influence edges upwards, it faces an important choice: do what the British and many others have done before them, and continue to deny tens of millions of its workers the working conditions and wages required to access adequate nutrition, schooling and healthcare, or provide its people with what the ILO calls ‘decent work’, along with a ‘social floor’ to guarantee basic needs. Workers’ access to social protection needs to be both easier and more portable; while the mandatory registration of principal employers and sub-contractors would help labour regulations and workers’ organisations find traction amid the chaos. Unfortunately the Indian government appears determined to travel in the opposite direction, and has tabled legislation that would raise thresholds for the applicability of labour laws so that fewer workers would be protected. It has also failed to respond to claims that the amended laws would prevent labour inspectors from choosing which worksites to inspect. If the Indian government fails to act, then others will. The ‘Make in India’ campaign, which aims to boost the country’s share of global manufacturing, could boost growth rates, but higher-profile reputation sensitive investors may baulk at research fast-tracked through social media indicating that millions sleep under blue plastic sheets on mud floors with minimal access to healthcare or social security. Organising informal workers has never been easy, but is on the rise in a number of states. The demands are hardly outrageous: decent working and living conditions and a national living wage so that all labourers can feed, clothe, house, and educate their families. India needn’t go the way of Victorian Britain. It just appears intent on doing so.